Anna Tanner is a senior on the bowling team. • The inaugural Big Walnut Youth Sports Forum, hosted by Big Walnut Youth Sports, will be Sunday, March 17, 2019 at 5–6:30 p.m., at Big Walnut High School, 555 S Old 3C Rd, Sunbury, Ohio 43074. Congrats to the Lady Eagles on their win over Groveport Madison bringing their record to 9-3. Big Walnut home Girls Basketball vs Unioto has been cancelled for Saturday 1/12/19 rescheduled TBD (Brian Shelton). Game Recap: Big Walnut Boys were Led by Sophomore Brayden Buch’s 366 series. He was followed by Johnny Laster’s 348 to improve to 5-1 on the season. Berlin was led by Logan Wright’s 316 series. Big Walnut Girls had 3 personal highs with their victory tonight (Jan. 8). Congratulations to Senior Caitlyn Lambert who threw her all time high game of 221 and a 365 series. Ashleigh Westervelt also threw her all time high game of 211 and the Girls season high series of 418. Kaitlyn Morrison also added a series of 379 with games of 204 and 175. This continues Big Walnut’s hot start with a 4-2 record heading into tomorrows match with Berlin. Game Recap: The Lady Eagles were led by Kaitlyn Morrison’s 359 series. Autumn Leidtke was right behind Kaitlyn with a 354 series. This is the Big Walnut Girls’ best start to a season at 5-2. Olentangy was led by Michele Statners 345 series. Meet Recap: The Big Walnut Swim and Dive Team competed against 12 other schools at the Central Ohio Splash held on Saturday, January 12 at the Thomas Worthington Aquatic Center. The Boys Dive team had a fantastic meet with Nate Dimitroff taking first place followed by Jameson Welker in third out of 12 divers. Micah Tillar and Trevor Ambrose also showed personal best scores at the event. For the ladies Eliana Smith came in fourth place out of 15 divers. The Boys Swim team took third place overall with a score of 243 just edging out Westerville South by five points. The Girls Swim team came in ninth place with a score of 100 but still had many strong finishes. Several swimmers had personal best times from the start of the season. Meet Recap: Wrestling BW Wrestlers beat the Saturday snowstorm and arrived at Madison Plains just after the snow started falling. The first round pitted BW’s Golden Eagles against the host MP Golden Eagles. Big Walnut easily defeated Madison Plains with falls by Lang, Parker, Jodrey, Coletta, Halbakken and both Max and Wyatt Lenz. The second round saw the Eagles matched up with Liberty Union. Again, Big Walnut easily handled the opponent led by falls from Parker, Piceno, Coletta and Max Lenz. London sent a shortened squad and became the Eagle’s 3rd round foe. Parker, Takatch, Coletta, Halbakken and Max Lenz all beat their opponents by pinfall to lead the Eagles to a 3-0 start. The fourth round put the Eagles against Central District opponent Whitehall-Yearling. Big Walnut needed bonus points from Parker, Halbakken, Austin O’Malley and Max Lenz to beat the Rams. In the final bout, Westerville South brought a strong team to face the Eagles. The match was a barn-burner with each team trading the lead several times. Ultimately, the Wildcats won the dual by one point on the final match. BW Wrestlers Andrew Parker, Josh Halbakken and Max Lenz all went 5-0 on the day. Josh Halbakken was voted by coaches as the tournament’s Most Valuable Wrestler. Senior Josh Halbakken (170) wins the Most Valuable Wrestler at Madison Plains. He went 5-0 with 4 falls and he wrestled up at 182 lbs twice. Great work Josh. Game Recap: Thursday’s Home OCC opener against Newark did not go as planned for BW Wrestlers. Coach Renner told the team each would have to wrestle to their potential in order to win. Unfortunately, the Wildcats were too much for the young BW Wrestlers. 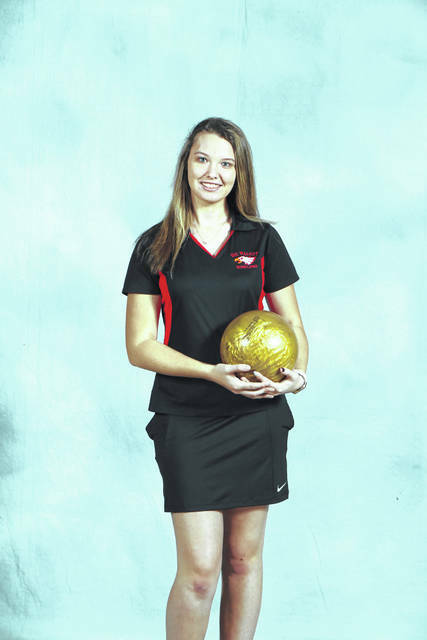 https://www.sunburynews.com/wp-content/uploads/sites/48/2019/01/web1_Bowler-Anna-Tanner.jpgAnna Tanner is a senior on the bowling team. Information for this story was obtained from the coaches and athletics department at BWHS.